Alfred Pearse is best remembered as a prolific and energetic artist for the Boy’s Own Paper, where he provided illustrations for 45 years (1878-1923), although this was only one of many papers he contributed to. Pearse was able to boast that he was the fourth generation of artists in his family. He was born in Paddington, London, 20 May 1855 (baptized on 18 November 1855), the second son of Joseph Salter Pearse, a celebrated decorative artist, and his wife Loveday Pearse (nee Colbron). Pearse grew up in London and was privately educated. He showed an early taste for drawing and between the ages of 15 and 19 studied wood engraving, but foreseeing ‘process’ work might supercede it, turned to drawing, studying at the West London School of Art for two years, where he was the honorary secretary of the sketching club. Pearse’s ability to turn out illustrations at speed earned him his first professional post. The Battle of Isandlwana took place on 22 January 1879, during which the colours of the 24th Regiment were rescued from the field by Lieutenants Melville (who earned a posthumous V.C.) and Coghill. 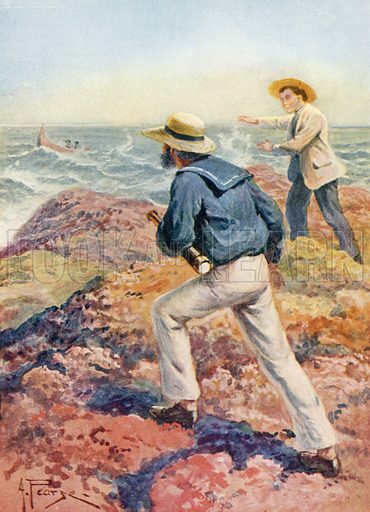 Hearing of the story at 8 am, Pearse completed an illustration and submitted it to the editor of the Pictorial World before noon the same day. This earned him a place on the staff for nine years, during which time he earned the nickname “Punctual Pearse”. Pearse sometimes had to resort to tricks to fulfil his role as a ‘special artist’. On the occasion of the Prince of Wales opening the new Agricultural Hall at Norwich, no tickets were issued to artists and Pearse entered the hall early in the morning and hid in a potato sack; emerging when the Prince arrived, Pearse was able to follow the Prince around and sketched enough to fill two pages of the Pictorial World, the one paper to have any representations of the ceremony that week. By special permission, he was invited to sketch the christening of the first-born of Her Royal Highness Princess Henry of Battenberg at Windsor Castle. He sketched the Royal Colonial Tour (1901-03) on behalf of The Sphere. Pearse put his rapidity with which he worked – producing 250 illustrations in 4 months – down to his athleticism. He was the secretary of three cricket clubs, was a good tennis player and could run 100 yards in 10 seconds. His artwork appeared in numerous journals, including Cassell’s Magazine, The London Magazine, Pearson’s Magazine, The Penny Magazine, Punch, The Royal Magazine, The Strand Magazine and The Wide World Magazine. His illustrations for children’s journals were not limited to Boy’s Own Paper and he also contributed to The Captain, The Girl’s Own Paper, The Girls’ Realm, Little Folks and Young England. As well as illustration, Pearse also sub-edited an illustrated paper and patented useful and ingenious inventions, besides also being a member of Sir Joseph Barnby’s Choral Society. Pearse died in London in 1933, aged 77. He was married to Mary Blanche Lockwood and had children Denis Colbron (1883-1971), Gladys May (1884), Lilian Gertrude (1885-1984), Dulcie Anette (1887), Marjorie Beryl (1888-1978) and Nessie Deane (1892-1963). Many more pictures by Alfred Pearse can be found at the Look and Learn picture library.